It can be tough to keep track of just what your kids are doing in the digital age. When your kids have a tablet in front of them, they could be reading a book, watching a movie or playing a game — and without paying close attention you can't be certain of what they're doing (or whether it's appropriate). Amazon's FreeTime Unlimited subscription does a great job of helping parents control just what their kids had access to on their tablets. The service includes 13,000 books, shows, apps and games that have been carefully curated to be appropriate for your child. And Parental controls are part of the package, letting you easily set time limits and restrict content. 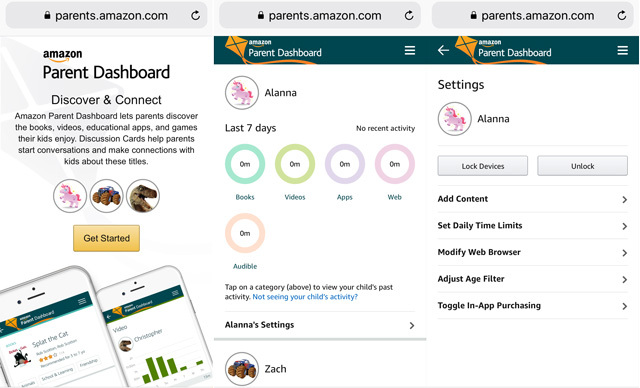 Now, Amazon has added the Parent Dashboard, which lets you easily see what your kids are doing and set parental controls without ever touching their device. It's a webpage you can access from anywhere, whether you're sitting in front of your computer or only have your smartphone, making it a snap to keep up with your child's activities. You can change screen time limits, set bedtimes, add apps or books, or lock (or unlock) the device for a period of time, whether you're sitting together in the living room or you're stuck in the office. But the Dashboard also has a wealth of information on your child's screen time habits. Opening it up shows all of your children's accounts with a breakdown of how much time they've spent reading, watching videos, using apps or browsing the web. You can click on any activity to drill down and see exactly what they've been reading, watching or playing, and for how long. On top of this comprehensive snapshot of your child's activities, the Parent Dashboard also helps you get involved with new Discussion Cards for parents. When browsing through the content your child has been viewing, you may see an orange conversation bubble pop up beside it. Clicking on the bubble will offer a summary of the content, suggested discussion topics to bring up with your child, and even a list of activities. For example, an app about animals may suggest volunteering at an animal shelter, encouraging your kids to explore their interests beyond the screen. You may be accustomed to doing a web search to learn more about the books and games your child is interacting with — but now it's all available in the Parent Dashboard. Considering how time-starved many parents are, this is a huge convenience. Not only will it help you spend more time with your child, it helps your child spend more time away from their digital devices. Discussion Cards are currently available for the most popular books, videos and apps, with more added every day. Parents have a variety of options for parental controls, including Google Family Link (free) and Disney Circle ($99). But Amazon's bundle of unlimited, moderated content with strong parental controls makes it a great package. While this kid-friendly subscription may seem pricey (particularly if you're a not a Prime member), if you're already buying your child books and apps, it's a pretty good deal. (And it's an even better deal if you consider the time you save by not sorting through age-appropriate apps and books yourself.) These new parental controls and Discussion Cards only make a good thing even better. Great article! I personally use others apps which I find simpler to use. Toddler Lock Timer - I set a timer and my kid thinks the battery has died since it goes to a black screen once the timer is over!